The next Asia-Pacific Regional Conference on Underwater Cultural Heritage will be held in Taiwan in 2020. Session proposals are being solicited until May 1, 2019. In keeping with the Conference theme and sub-themes stated below, submit a 300-word abstract and session title before May 1st, together with the name of the session organiser, affiliation and email address. 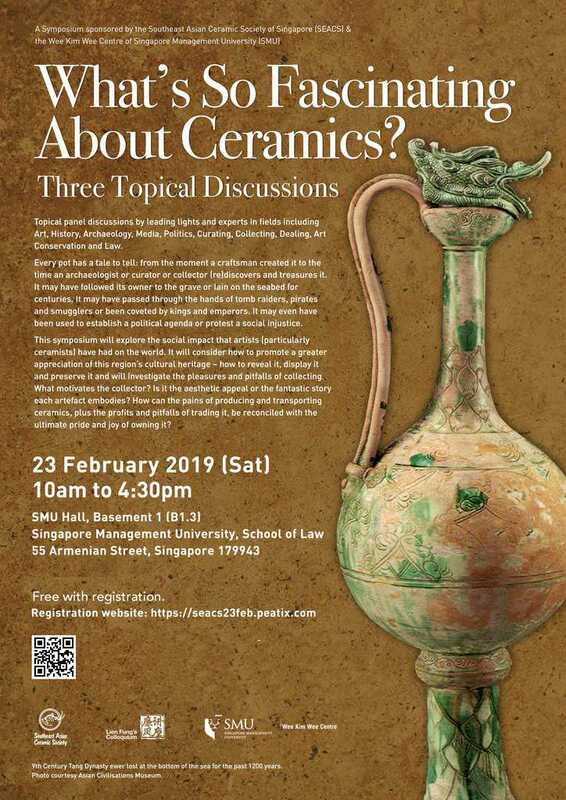 [Symposium] What’s so Fascinating about Ceramics? The Southeast Asian Ceramic Society together with the Singapore Management University (SMU) is holding a one-day symposium on 23 February entitled “What’s so Fascinating about Ceramics” that will consist of three panels discussing the roles ceramics have played throughout history as vehicles of culture, propaganda, greed, community and heritage. Panelists include experts in fields including art, history, archaeology, media, politics, curating, collecting, dealing, art conservation and the law. Venue: SMU Law School, Singapore on Saturday 23 February. The Annual Philippine Studies Conference SOAS focuses its 2019 edition on the southern island of Mindanao. It seeks to gather academics, policymakers, cultural workers, artists and scientists to map the contours of Mindanao’s struggle for peace after centuries of violent strife. This struggle is complex and, as an object of study, extremely dense. Its dimensions are simultaneously global, national, and local —and these layers are often collapsed into each other. The Conference takes up the challenge of addressing this complexity and density with a new emphasis on cultural analysis. In the course of the last few decades, it has become abundantly clear that the integration of multi-disciplinary approaches requires a cultural perspective. In taking up mapping as a metaphor for approaching Mindanao, the Conference draws attention to the porous and overlapping ethnolinguistic homelands; conceptual and physical sites of conflict, resolution, and/or cycles of seemingly perpetual repeats. The island — volatile home to Muslim, settler, and autochtonous societies variously staking out claims for resources, territory, and opportunity— can in fact only be mapped with great nuance and a strong sense of dynamic cultural transformation. Happening next year from 25-27 June 2019 in Brisbane, Australia. Readers in Bangkok may be interested in this heritage conference in January next year. At a time of rapid economic, technological, and social changes, the Siam Society Under Royal Patronage, a leading Thai civil society organisation in the field of cultural heritage together with the Ministry of Culture and Tourism Authority of Thailand, is hosting a conference entitled “Heritage Protection: The Asian Experience”, held in the English language, in Bangkok, on 25th – 26th January 2019. The conference will bring together Asian thinkers, professionals, and practitioners in the field of cultural heritage protection who will examine the meaning of “Culture”, “Cultural Heritage”, and “Cultural Heritage Protection” in Asian nations. A well-developed corpus of conventions, guidelines, and internationally accepted best practices for cultural heritage protection already exists, which largely arose out of successful European experiences in heritage protection in the 19th and 20th centuries; hence, it is only natural that heritage protection theories reflect such European experiences. 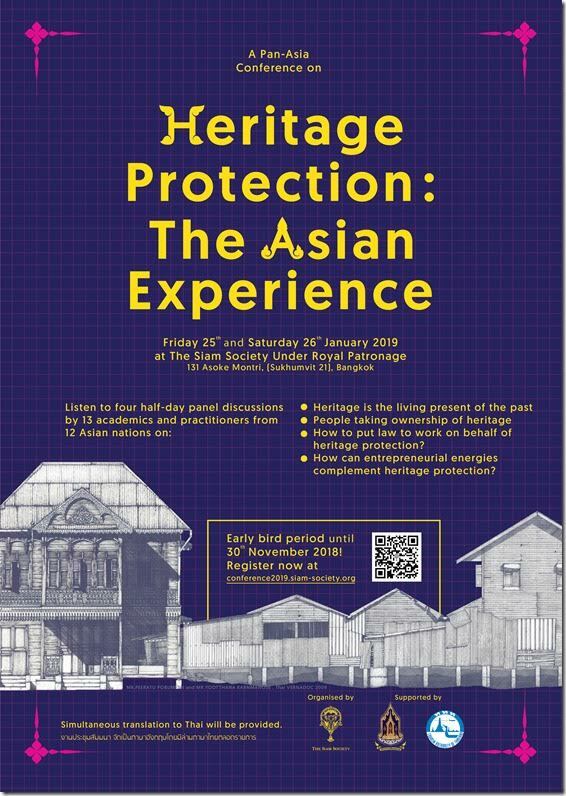 This conference invites Asian speakers to describe cultural heritage from an Asian perspective, recognising the diversity of cultures and cultural heritage protection experiences across the Asian continent. The speakers will look at various aspects of the Asian experience of cultural heritage protection within diverse Asian settings to determine: what are the main obstacles to successful heritage protection; what works and what does not; what lessons can be drawn for Asian people from Asian experiences? Furthermore, they will suggest cultural heritage protection strategies most likely to be effective within the Asian socio-cultural and political contexts, focusing on community involvement, the role of law, and entrepreneurs’ contributions. Heritage is the living present of the past. People taking ownership of heritage. How to put law to work on behalf of heritage protection? Speakers from twelve nations will participate on the panels, each delivering a 20-minute oral summary of the main points of their respective papers. (The abstract of each paper will be published in the Conference Booklet to be distributed to all the attendees.) A moderator will pose questions, solicit audience participation, and conclude the sessions. At the end of the conference, two seminar rapporteurs will synthesize key points and themes that arose during the four sessions. A book compiling the conference papers will come out in 2019 for widespread distribution throughout the Asian region. Greetings from Katipunan Arkeologists ng Pilipinas, Inc. (Society of Philippine Archaeologists), Bahay Saliksikan, Bulacan State University and the City of Malolos! On 8 December 2018, we will be holding the 11th KAPI Conference at Bahay Na Tisa, Malolos Bulacan. We are inviting archaeologists, related researchers, and cultural workers to disseminate and update the community in their research findings, build networks and linkages, and discuss issues on the country’s archaeological heritage. With the theme: “Peoples, Things, and Cultures: Papers on Integration in Philippine Archaeology”, papers and posters that contribute to the conference abstract are welcome. You can submit your abstract by emailing kapi.org.ph@gmail.com containing the title and abstract of no more than 300 words. Papers may be presented in either Filipino or English. Deadline for abstract will be on November 5, 2018 (Monday). You may already pre-register at this online form: https://goo.gl/forms/N1psTSzjB7KP12Cr1 and check out our website www.kapi.org.ph for more details about the conference. The next EuroSEAS conference will be held in Berlin from 10-13 September 2019 and will be hosted by the Humboldt-Universität zu Berlin. 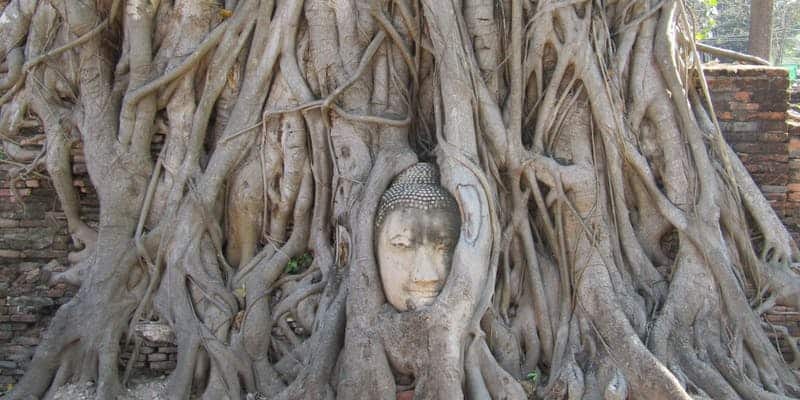 The European Association for Southeast Asian Studies (EuroSEAS) will hold its 10th conference from 10 to 13 September 2019 at the Humboldt-Universität zu Berlin. 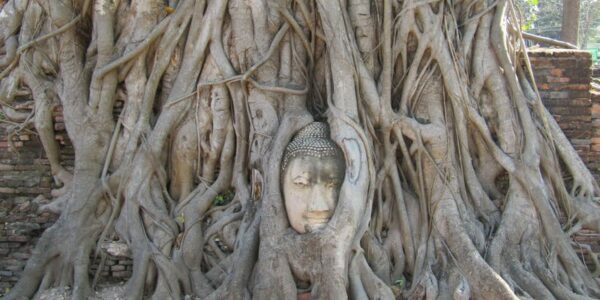 As an international and multi-disciplinary organisation, EuroSEAS invites scholars and PhD students from all academic disciplines with an interest in Southeast Asia to submit panels that explore relevant research topics from an interdisciplinary perspective as well as discuss theoretical and methodological aspects of research generated in the field of Southeast Asian Studies. Proposals are also invited for a limited number of roundtable discussions about recent developments in Southeast Asia and for laboratories that would develop cross-disciplinary collaboration. Proposals for panels, roundtables and laboratories do not need a list of participants, just an abstract and a convener will do! Panels consist of a convener, 3-4 presenters, and if possible, a discussant. Double sessions of max 6 presentations are allowed. We invite panels on a wide range of topics in the social sciences and humanities of Southeast Asia. We prefer panels with a geographical comparative approach and panels that cross disciplinary boundaries. We especially invite panels on climate change, literature, performing arts, and archaeology – fields that were underrepresented in previous conferences. Submission format: (1) title, (2) convener, (3) brief description of panel, max ½ page, (4) single session (1 x 90 min. ): 3-4 presenters; double session (2 x 90 min. ): 6 presenters, (5) optional: discussant. Roundtables address current issues and new developments, and consist of a convener and max. 6 participants who prepare brief statements followed by audience discussion. Submission format: (1) title, (2) convener, (3) explain in ½ page urgency of topic, (4) max 6 presenters. Laboratories are closed meetings for young scholars to develop innovative cross-disciplinary plans. Laboratories run for half a day and consist of a convener and max 8 participants. Towards the end of the conference conveners will present the results of these meetings to a larger audience. Submission format: (1) title, (2) convener, (3) explain in ½ page plans for discussion and collaboration, (4) max 8 participants. Please send your proposals to euroseas@kitlv.nl by 1 December 2018. For inquiries, please contact Henk Schulte Nordholt (euroseas@kitlv.nl). 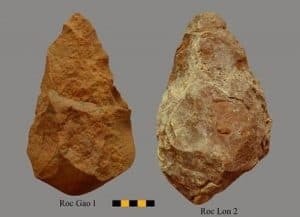 via Viet Nam Net, 25 September 2018: A news mention about the IPPA congress going on this week, where I have been following up on the latest archaeological developments in the region and catching up with old and new friends. You can follow the live twitter coverage here. The 21st Congress of the Indo-Pacific Prehistory Association (IPPA) has opened in the former imperial city of Hue in central Thua Thien-Hue province, bringing together 700 archeologists from 35 countries, including the host Vietnam. The six-day congress will continue until September 28, with several separate topic meetings as well as visits to relics built by the Nguyen Dynasty (1802-1945) in Hue. 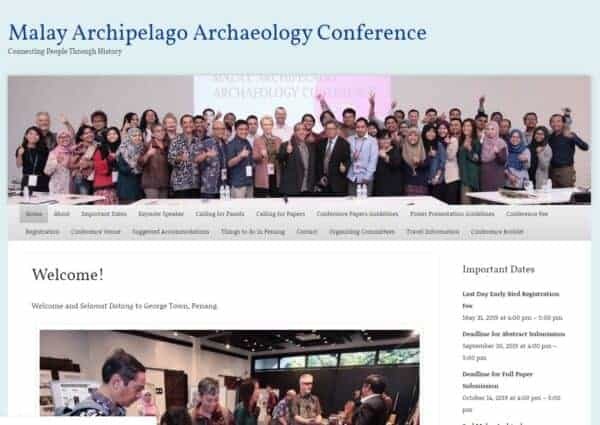 IPPA Secretary-General Ian Lilley said the congress would be a chance for archeologists around the world to gain a deeper understanding of the progress of archeology in the Indo-Pacific region.